Wow! Good evening. What a tremendous night. I think you now know why I’m so proud of our students, aren’t they great? They certainly are a hard act to follow. Thank you, Andre, and each of you standing up here, for being part of this celebratory night. I’d like to also thank our Presidential Ambassadors who welcomed our guests and showed many of you to your tables. All of our students are moving into exams next week and we appreciate their time tonight. Let me also thank our sponsors, I’m so grateful for your support. Many of you have been with us since the beginning – and each and every partnership has been important to our journey. Many thanks to Rob Gidel, for your leadership not only tonight, but as our first board chair. I also thank you and your family for your commitment to an endowed President’s fund. And to the entire Advancement team – you are the winning formula. And of course, thank you to everyone here tonight for taking the time to be with us this evening to celebrate all we have accomplished together. What I’d like to talk about tonight is shaping the exponent. Eight years ago, a changemaker from Polk County recognized that Florida’s economy was dependent on three industries – agriculture, tourism and construction – and those industries used mostly low-skill, low wage trades. He also recognized that if we were serious about raising the quality of living for millions of Floridians, we needed to build a high skill, high wage economy based on technology. Building that economy required a new university devoted to the education, discovery, and application of technology. We needed a new university that was a different kind of university. Six years ago today, we got that different kind of university as Governor Scott took a bold step and signed Florida Polytechnic University into existence. A different kind of university with a clear focus on two goals. The first goal was to create a university where students got high-paying jobs after graduation–and to prepare those students to contribute on their first day of work. The second goal was to catalyze a high-technology economy in Florida, beginning in Polk County. What we call Florida Poly 1.0 has been focused on that first goal, and we’re here tonight to celebrate our remarkable accomplishments. In just four short years, we’ve created a unique curriculum in six emerging technical fields. Fields that are important to growing Florida’s economy and ensuring high-paying jobs for our graduates. Our curriculum includes a strong emphasis on theory and fundamentals that make our students lifetime employable. But it also emphasizes practical skills in critical thinking and real-world problem solving through student projects, competitions, and entrepreneurship. We already have a relationship with well over 200 companies that provide projects for our students, internships, and careers. It’s a little early for the exact numbers, but students in the inaugural graduating class are already receiving salaries $10 to $30,000 more than the average from across the State University System. In just under three years, we received SACSCOC accreditation, met all of our statutory requirements, and fulfilled our promise to the State of Florida that we would have an accredited institution devoted entirely to STEM. As Florida Poly matures, we’ll expand the number of degrees we offer to increase our impact, and we’ll continue to build programs and efforts that lead to highly sought-after graduates. Many of our sister institutions have relationships with large out-of-state corporations, which often result in up to 50 percent of their engineering graduates leaving the state. As a university dedicated to growing Florida’s economy, we will expand our career services to not only better prepare students for their career, but to grow relationships with companies that have a strong Florida presence to retain our graduates here in the State. We know that existing companies lose almost 1M jobs a year, while new companies add three million jobs to the economy each year, so we’ll expand our efforts in entrepreneurship to help our students and faculty create new technology ventures. In Florida Poly 1.0 we offered our students scholarships to reach our legislatively mandated goal of student growth. Thanks to all of you who made that scholarship opportunity possible. In Florida Poly 2.0 we must continue to offer attractive scholarships to remain competitive and to recruit the most talented STEM students from across the state and nation. We will establish ourselves as the most selective university in Florida. Already, our incoming student quality has soared as our average SAT scores have now passed well-known engineering schools around the nation like Michigan State, Penn State, Texas A&M, Clemson, Ohio State, NC State, Virginia Tech, and Cal Poly. Our students are smart, they are driven, they are creative, they are risk-takers and they certainly excel in their STEM fields. But we recognize that hard skills are only part of the equation. In fact, a recent survey found that 92 percent of executives said soft skills were just as important, if not more important than hard skills. So to make sure we graduate well-rounded engineers, we visited the Air Force Academy this past year to learn more about their nationally recognized program around leadership. Our Leadership Institute will weave leadership and soft skill development into the very fabric of everything we do at Florida Poly. By incorporating these critical soft-skills we will ensure our students have productive and successful careers. 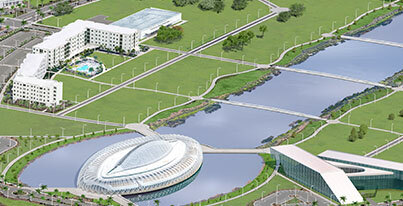 In Florida Poly 2.0 we’ll turn our attention towards economic development. Florida Poly WILL BE the economic game changer we were created to be. Traditional universities play an important role in our economy because they create new knowledge in high-risk, high pay off areas. We call that tech push and the payoff is often measured in decades. But as the global economy continues to grow, our industry partners need help solving today’s problems, not tomorrow’s. So we’re committed to application pull, instead of tech push. To this end, we’ll be unique in our alignment around emerging industries that help position Florida as a leader in the high-tech/high-wage jobs competition. These are the industries identified by our EDCs, the Florida Chamber and The Council of 100 as likely industries for growth. Critical industries such as healthcare, defense, freight and logistics, information systems, agritech, sustainability, and advanced manufacturing will be our areas of focus. And of course, one of the most important industries is Connected and Autonomous Vehicles, which some estimate to be an over $100 billion market. Through our partnership with Florida Turnpike Enterprise and SunTrax, we are well-positioned to help Florida capture a large part of that market. FTE is building the most advanced testing center in the nation, and Florida Poly is creating an Advanced Mobility Institute that will provide the expertise in sensors, signal processing and Artificial Intelligence needed to attract industry. As we build these industry relationships we’ll work with companies in each of our strategic areas to understand their technology needs, and then we’ll develop concentrations around those needs. The Applied Research Center (ARC) will house the labs that serve as the nucleus for this important effort. The ARC will be another iconic building on our campus that attracts national interest and leading faculty. This building will provide a state of the art facility for translational faculty research, student projects and entrepreneurship. The impact of the ARC will be felt far beyond this campus through job creation, attracting and creating research talent, capital investment and enhanced partnerships. We are committed to build the infrastructure, culture and environment needed to encourage industry-inspired, problem-driven research for near-term impact. As many of you know, companies and technology do not grow linearly. They start off slow and grow incrementally until at some point there is an inflection, after which they grow exponentially. How fast that growth is depends on the exponent. I hope all of will join Florida Poly in our journey to shape that exponent. Thank you for all you’ve done, and for being here tonight. And now I’d like to welcome back to the podium, my friend and mentor, Rob Gidel.